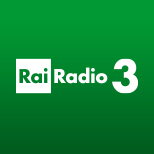 Radio 3, its programming includes cultural shows, music, arts and teathre. 90 hours of high quality music and 50 hours of cultural programming. its main shows are prima pagina and pagina 3 about news and actuality debates, respectively. Prima pagine, one of it main news shows has 646,000 daily listeners.